We all have our own individual style which distinguishes us from the crowd. Yes, a number of other people might have a similar style – but we all wear it differently, in our own little way. Owning a number of lipsticks from across the Rimmel Apocalips range – it’s safe to say that this is one of my favourite lipstick products, whether we’re discussing a glossy or matte finish. 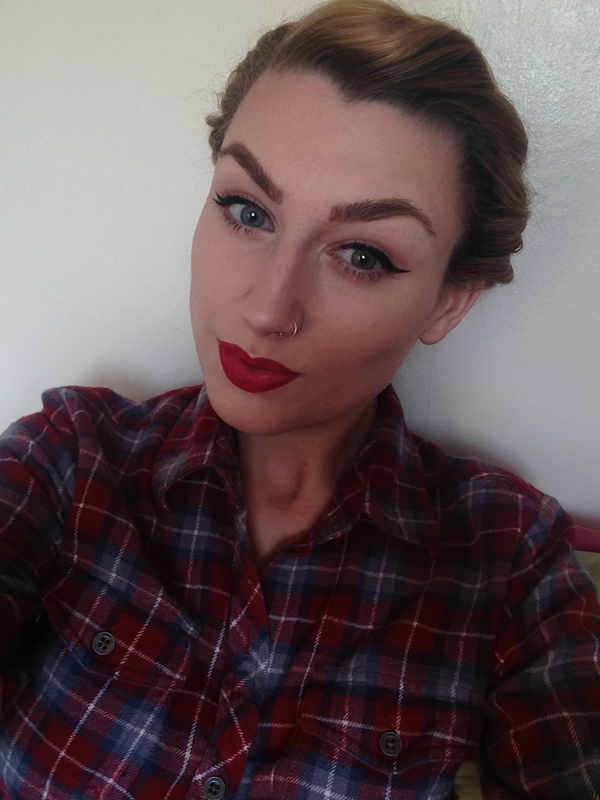 More often than not, I will choose to team the Rimmel Apocalips Matte Lip Lacquer in ‘Burning Lava’, with simple, black winged liner, subtle contouring and an all-around, pinned-back quiff up-do (pictured). I can also strongly suggest the ‘Atominc Rose’ matte shade, if you’re looking for a more subtle finish. I suppose, therefore, that this would be considered as my ‘go-to’ make-up look. So what is my matching ‘go-to’ garment? Now, we’ve all heard the ‘every girl needs to own that one little black dress’ line on repeat since the age of 16, but in my eyes, every girl should own at least 5 favourite black dresses, whether short or long, bodycon shaped or loosely fitted. Therefore, this is just one of my top 5 (hundred…) black dresses – a Topshop number purchased roughly one year ago. When styled up with a leather jacket and high heels – it’s perfect for evening wear, while it can also be used as a base for layering, for more practical daytime purposes. Tight fitting (in all the right places), with two daring side slits and a high neck; I fell in love with this dress from the moment I picked it up off of the shelf. It’s undoubtedly a well-suited match for my pear shaped body and quite frankly, makes me feel ‘a million dollars’. I’d love to hear all about your go-to style and favourite LBD, so please follow my blog and comment in the space below.